Surveillance cameras are ubiquitous – we are so used to seeing them in stores, in places of business, and even on streetlights around town, that we no longer even question just what is being recorded and just who is watching. The cameras we see – are they for our security and safety? Or are they for other, sinister reasons for which we have no knowledge? Let’s consider the two options. First, however, let’s start from the beginning: Just how long has video surveillance been part of our society? 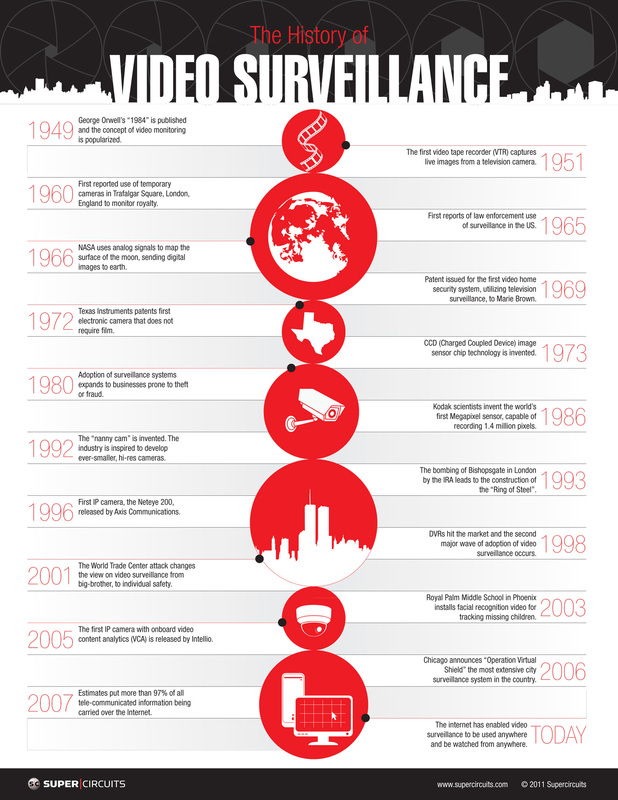 The following infographic, courtesy of SuperCircuits.com, provides an excellent overview of the history of video surveillance. So if video surveillance is for our security and safety, just what does it accomplish, and how? In government buildings to monitor the safety and security of public servants. In banks and financial institutions, to provide recorded data in the event of a theft. In stores and other places of business for crime deterrence, to monitor theft, or perhaps to prevent incidents and accidents in the workplace. Around homes and residences, to help deter crime. In homes and residences, to monitor infant sleeping quarters while the parent or guardian is in another part of the home. In police cars and even worn bodily on police officers, to provide accurate representation of traffic stops and arrests. In military and battle situations, by overhead drone deployment, to monitor the battlefield and provide intelligence information to the soldiers on the ground. All of the above video surveillance uses are beneficial to society. When used properly, the cameras help to deter crime, help to solve crime (there have been many instances where law enforcement officials have used recorded video footage to bring perpetrators to justice, such as these examples here involving the capture and conviction of murderers), and to simply monitor the safety of the public as a whole, in buildings and on city streets. But, as technology advances and becomes more complex, so also do the techniques of criminals. As video cameras get smaller, and the quality of the video recording continues to get better, those individuals with malicious or subversive intentions continue to find new methods to utilize them, and new locations in which to install them. This practice has increasingly caused Invasion of Privacy complaints. Without their consent, innocent victims are finding that their private lives are, or have been recorded, for the financial benefit or the voyeuristic proclivities of others. Worse, according to some, is the idea that a citizen’s very own government may be secretly recording his or her daily life, to monitor and gain control of their activities. So is the rise of video surveillance a boon or a bane? On the one hand, there are indisputable benefits to having, live recording video cameras around us, while on the other hand, those same video files can be used against us, to our detriment. Ultimately, it’s a trade-off, and one that will be debated for years to come. One thing is certain, however, the addition of video surveillance to the operational procedures of certain businesses is essential to the safety and security of it’s customers. In businesses such as self-storage, recorded, video surveillance helps to ensure peace of mind for those who lease space there – providing them with the assurance that their stored goods are under the watchful, electronic eye of a video camera. So, when it’s your turn to choose a business to service a particular need, consider for yourself what it is that truly is your bother – and then decide if it warrants a big brother.